getting a bill in the mail isn’t any fun, but you know what they say about lemons and lemonade, right? being small business owners, we get tons of bills, and over the years we’ve been collecting the ones with interesting security patterns printed on the insides. we’ve used them in various craft projects here and there, but one of our favorites requires practically no materials or skill and is a great way to whip up some unique and wonderful stationery. I love this idea. I can’t wait to get my next bill! egads! this is genius – i can’t wait to get today’s mail! 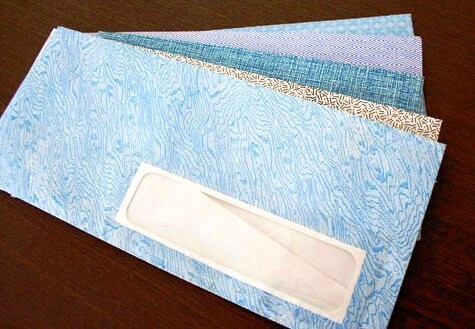 would steaming help de-construct the envelopes, or could it warp them or make the pattern bleed or separate the windopane glue? such a nice idea, thanks for sharing! I wish the ones here in Sweden would look that nice… Great idea!! Getting post is so exciting. Getting ‘beautiful’ post would be even more exciting. Great idea! Great idea– the designs of the security papers give the envelopes a dated look and who can resist the lure of vintage office supplies? Clever! I have never seen such pretty envelope insides. This is such a great idea! I’ve cut them up and made them into smaller notes before, but this seems so much more satisfying. Thanks! Wow, that’s such a simple but brilliant idea! I’ve never known what to do with those envelopes before, and the result looks like something from a cool stationery store. Thanks for the awesome diy! This is such a great idea!! Thanks. ohhh… i just LOVE this idea! i see a pile of used envelopes in my future! ha! What a great idea. A while back, I lamented the excess of security envelopes in my life. Now, I have a new take, and a new craft project. Thanks for posting. I do this all the time and I love it! So pretty and really surprises people when they get them. I’ve used them as book pages and for different decoupage. How cute! I love everyday design touches like these. great idea! I have actually been saving all my envelopes to do this very thing! I pay all my bills online so I get an overload of unused return envelopes in the mail! This is great! 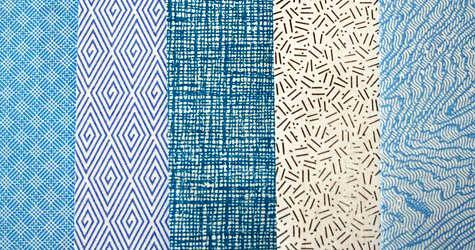 But how do you know whether your envelope in the mail will have an interesting pattern on the inside? oooooooooh! i love this. some even look a little faus bois-ish. I love this! I can’t wait to use it! I LOVE this idea…had to run to the recycling bin to find one to do this right away! Delta Dental provided me with one that has a black pen & ink type cross-hatching…thanks! Wow- you guys are genius! Love it!!! this is great- do you think someone’s job is to design the insides? that would be funny. It sounds silly now, but I’ve seen similar things and couldn’t figure out how to do it without cutting the envelope. Thanks! I’m in love with the inside of business envelopes! I use them to make cards. This is a great idea! I keep samples too but never thought of reusing them inside out. I’ve always wondered why they only come in blue and black ink but as the Joseph King flickr set proved, they do come in other colours like red and yellow. such a cleaver idea, and a great way to recycle! What a creative idea, Can’t wait to try it! These are off the hook!!! Clever! Clever! my latest collage work. Creative minds think alike! Remake has an Etsy shop and has been selling amazing stationery made out of security envelopes for awhile now. I bought some from her last year and they were so cool! I don’t think she currently has any for sale, but you should check her stuff out soon. it’s terrible. i’m a receptionist so all day long i see envelopes! i do this all the time! its a great way to never have to buy envelopes, and its green. great post! that is so genius – i LOVE it! I love the recycled aspect and that it cost almost nothing to make this! Great post! Oh I can’t wait to send one of these to my MIL. She is the queen of reusing envelopes, packaging, wrapping, paper, etc. Half the time we don’t even know how USMail can find the address on her reused envelopes. Such a simple idea, but so great! I’ve used the inside prints for other craft projects, but this will be another fun thing to do! I find this idea rather exciting! Brilliant! I can’t believe I just threw away 3 junk credit card offers yesterday. I use these papers as backing papers for greeting cards and also to fold origami shirts for men’s greeting cards. Too funny… I meant to show you my collection of bill envelopes I have hiding in a box under the bed when you were here last week. I have done the very same thing and used many of them for mailing out the ATC’s. I Love this idea – what a great way to recycle too! damn. this is freaking brilliant. I’m so going to have to try this. Please don’t drop them in the mail in the USA with the return address in the lower window. The postal sorting equipment will use the lower address as the delivery address and your letter will be returned. This is a wonderful idea. When I soak stamps off of paper (usually the corner torn off of an envelope), I keep the little bits because the patterns are so beautiful. I’m still not sure what I will do with them, but I can’t bear to throw them away. Love it! Have been doing this since I saw this post, and though my teenage daughter thinks I’m easily amused (and that’s not necessarily in a good way), I shall carry on. I think it’s a brilliant idea. This is a really brilliant idea, thanks for posting! I use steam. It’s much easier and neater. It doesn’t make the pattern bleed, or separate the windowpane glue. Love love love this idea! What were some of the other projects you did with the envelopes?? How simple! I would never have thought of it. Only…I don’t even get many security envelopes, either these days! I had to laugh, my Grandpa did this years ago, he didn’t like to throw things away. 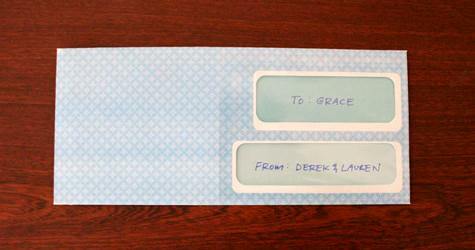 We’d get letters from Grandma in these inside-out envelopes all the time! I’m going to have to try this. Great idea!